A tuberous-rooted perennial most often grown as an annual or a houseplant, ‘White Queen’ has large frosted looking white leaves that have green margins and bright red veins that “bleed”. 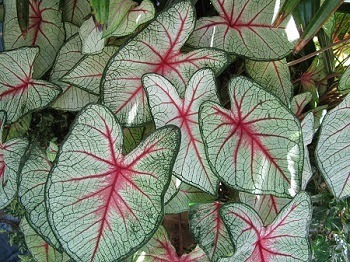 Noteworthy characteristics: Large white leaves with green margins and prominent red veining. Contact with the plant may cause skin irritation and stomach upset if ingested. Propagation: Divide in spring and dust cut tubers with fungicide. Plant tubers 1 inch deep. Pests and Diseases: Insect pests include spider mites, nematodes and aphids. Tuber rot, blight and leaf spot can affect your angel’s wings plant. nematodes. Aphids and spider mites can bother plants indoors.